It has long been recognized that tourism unhindered and unrestricted can have extremely negative social, cultural, environmental, and economic consequences. As a result, new approaches to tourism development have emerged in recent decades to mitigate the worst of these effects. Tourism planning, based on sound principles of sustainable development, has the potential to improve the outcomes of tourism by empowering destination residents, preserving the cultural and ecological integrity of destinations, and engaging indigenous knowledge. As work in tourism planning continues to flourish, this new title from Routledge’s Critical Concepts in Tourism series meets the need for an authoritative reference work to make sense of a vast and dispersed body of literature. Edited by Dallen J. Timothy, Editor-in-Chief of the Journal of Heritage Tourism, Tourism Planning is a four-volume collection of classic and contemporary contributions. It brings together material drawn from a plethora of journals, as well as pieces from key books and difficult-to-find sources. With a comprehensive introduction, newly written by the editor, which places the collected materials in their historical and intellectual context, Tourism Planning is an essential work of reference and is sure to be welcomed by scholars, students, and practitioners as a vital one-stop resource. This volume describes the need for tourism planning in general terms. It details the negative and positive impacts of tourism highlights the lack of organized planning in the past and the kinds of problems this has created, such as environmental degradation and negative socio-economic impacts of tourism development. It explains non-planning practices, such as boosterism and mass tourism promotion, as some of the main culprits of these changes and suggests the need for better planning approaches. 1. Andriotis, K. (2001) Tourism planning and development in Crete: recent tourism policies and their efficacy. Journal of Sustainable Tourism, 9(4): 298-316. 2. Aswani, S., Diedrich, A. and Currier, K. (2015) Planning for the future: mapping anticipated environmental and social impacts in a nascent tourism destination. Society & Natural Resources,　28(7): 703-719. 3. Brohman, J. (1996) New directions in tourism for third world development. Annals of Tourism Research, 23(1): 48-70. 4. Chapman, A. and Speake, J. (2011) Regeneration in a mass-tourism resort: the changing fortunes of Bugibba, Malta. Tourism Management, 32(3): 482-491. 5. Davis, J.S. and Morais, D.B. (2004) Factions and enclaves: small towns and socially unsustainable tourism development. Journal of Travel Research, 43(1): 3-10. 6. Deery, M., Jago, L., and Fredline, L. (2012) Rethinking social impacts of tourism research: a new research agenda. Tourism Management, 33(1): 64-73. 7. García, F. A., Vázquez, A. B. and Macías, R. C. (2015) Residents’ attitudes towards the impacts of tourism. Tourism Management Perspectives,　13: 33-40. 8. Gladstone, D.L. (1998) Tourism urbanization in the United States. Urban Affairs Review, 34(1): 3-27. 9. Gu, H. and Ryan, C. (2008) Place attachment, identity and community impacts of tourism—the case of a Beijing hutong. Tourism Management, 29(4): 637-647. 10. Hillery, M., Nancarrow, B., Griffin, G., and Syme, G. (2001) Tourist perception of environmental impact. Annals of Tourism Research, 28(4): 853-867. 11. Knowles, T. and Curtis, S. (1999) The market viability of European mass tourist destinations: a post-stagnation life-cycle analysis. International Journal of Tourism Research, 1(2): 87-96. 12. Liu, Z. (2003) Sustainable tourism development: a critique. Journal of Sustainable Tourism, 11(6): 459-475. 13. Mbaiwa, J.E. (2005) Enclavic tourism and its socio-economic impacts in the Okavango Delta, Botswana. Tourism Management, 26(2): 157-172. 14. Mordue, T. (2007) Tourism, urban governance and public space. Leisure Studies, 26(4): 447-462. 15. Mullins, P. (1991) Tourism urbanization. International Journal of Urban and Regional Research, 15(3): 326-342. 16. Nyaupane, G. P., Lew, A. A. and Tatsugawa, K. (2014) Perceptions of trekking tourism and social and environmental change in Nepal's Himalayas. Tourism Geographies,　16(3): 415-437. 17. Schmallegger, D. and Carson, D. (2010) Whose tourism city is it? The role of government in tourism in Darwin, Northern Territory. Tourism and Hospitality Planning & Development, 7(2): 111-129. 18. Sharpley, R. (2014) Host perceptions of tourism: A review of the research. Tourism Management,　42: 37-49. 19. Tosun, C. (2002) Host perceptions of impacts: a comparative tourism study. Annals of Tourism Research, 29(1): 231-253. 20. Tovar, C. and Lockwood, M. (2008) Social impacts of tourism: an Australian regional case study. International Journal of Tourism Research, 10(4): 365-378. 21. Treuren, G. and Lane, D. (2003) The tourism planning process in the context of organised interests, industry structure, state capacity, accumulation and sustainability. Current Issues in Tourism, 6(1): 1-22. 22. Weaver, D.B. (2012) Organic, incremental and induced paths to sustainable mass tourism convergence. Tourism Management, 33(5): 1030-1037. 23. Wilson, T.D. (2008) Economic and social impacts of tourism in Mexico. Latin American Perspectives, 35(3): 37-52. 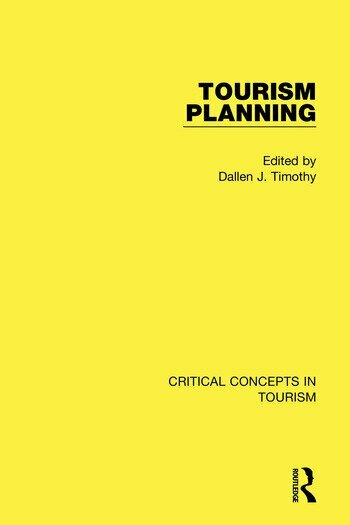 This volume describes the process of planning for tourism and the various types of planning that take place. In addition to describing the planning process, it examines physical or spatial planning, which is based upon traditions of urban planning and landscape planning. It also assesses the important concept of scale and regional planning, which entails understanding entire areas as holistic systems that have to be planned and managed systematically. This volume will be especially rich in case studies that are well documented in the mainstream scholarly literature. 24. Connell, J., Page, S.J. and Bentley, T. (2009) Towards sustainable tourism planning in New Zealand: monitoring local government planning under the Resource Management Act. Tourism Management, 30(6): 867-877. 25. Dredge, D. (2001) Local government tourism planning and policy-making in New South Wales: institutional development and historical legacies. Current Issues in Tourism, 4(2/3): 355-380. 26. du Cros, H. (2001) A new model to assist in planning for sustainable cultural heritage tourism. International Journal of Tourism Research, 3(2): 165-170. 27. Harrill, R. (2004) Residents’ attitudes toward tourism development: a literature review with implications for tourism planning. Journal of Planning Literature, 18(3): 251-266. 28. Harrill, R. and Potts, T.D. (2003) Tourism planning in historic districts: attitudes toward tourism development in Charleston. Journal of the American Planning Association, 69(3): 233-244. 29. Hasse, J.C. and Milne, S. (2005) Participatory approaches and geographical information systems (PAGIS) in tourism planning. Tourism Geographies, 7(3): 272-289. 30. Heitmann, S. (2010) Film tourism planning and development—questioning the role of stakeholders and sustainability. Tourism and Hospitality Planning & Development, 7(1): 31-46. 31. Jamal, T., Borges, M. and Figueiredo, R. (2004) Systems-based modeling for participatory tourism planning and destination management. Tourism Analysis, 9(1/2): 77-89. 32. King, B., McVey, M. and Simmons, D. (2000) A societal marketing approach to national tourism planning: evidence from the South Pacific. Tourism Management, 21(4): 407-416. 33. Ladkin, A. and Martinez Bertramini, A. (2002) Collaborative tourism planning: a case study of Cusco, Peru. Current Issues in Tourism, 5(2): 71-93. 34. Lai, K., Li, Y. and Feng, X. (2006) Gap between tourism planning and implementation: a case of China. Tourism Management, 27(6): 1171-1180. 35. Liu, A. and Wall, G. (2006) Planning tourism employment: a developing country perspective. Tourism Management, 27(1): 159-170. 36. Malek, A. and Costa, C. (2015) Integrating communities into tourism planning through social innovation. Tourism Planning & Development, 12(3): 281-299. 37. McCool, S.F. (2009) Constructing partnerships for protected area tourism planning in an era of change and messiness. Journal of Sustainable Tourism, 17(2): 133-148. 38. Nyaupane, G.P. and Poudel, S. (2012) Application of appreciative inquiry in tourism research in rural communities. Tourism Management, 33(4): 978-987. 39. Oviedo-Garcia, M.A., Castellanos-Verdugo, M. and Martin-Ruiz, D. (2008) Gaining residents’ support for tourism and planning. International Journal of Tourism Research, 10(2): 95-109. 40. Page, S.J. and Thorn, K. (2002) Towards sustainable tourism development and planning in New Zealand: the public sector response revisited. Journal of Sustainable Tourism, 10(3): 222-238. 41. Reid, D.G., Mair, H. and George, W. (2004) Community tourism planning: a self-assessment instrument. Annals of Tourism Research, 31(3): 623-639. 42. Ruhanen, L. (2004) Strategic planning for local tourism destinations: an analysis of tourism plans. Tourism and Hospitality Planning & Development, 1(3): 239-253. 43. Sharpley, R. (2008) Planning for tourism: the case of Dubai. Tourism and Hospitality Planning & Development, 5(1): 13-30. 44. Spencer, D.M. (2010) Facilitating public participation in tourism planning on American Indian reservations: a case study involving the Nominal Group Technique. Tourism Management, 31(5): 684-690. 45. Tosun, C. and Jenkins, C.L. (1996) Regional planning approaches to tourism development: the case of Turkey. Tourism Management, 17(7): 519-531. 46. Tosun, C. and Timothy, D.J. (2001) Shortcomings in planning approaches to tourism development in developing countries: the case of Turkey. International Journal of Contemporary Hospitality Management, 13(7): 352-359. 47. Vila, M., Costa, G. and Rovira, X. (2010) The creation and use of scorecards in tourism planning: a Spanish example. Tourism Management, 31(2): 232-239. 48. Woodward, S.C. (2004) Faith and tourism: planning tourism in relation to places of worship. Tourism and Hospitality Planning & Development, 1(2): 173-186. 49. Wray, M. (2011) Adopting and implementing a transactive approach to sustainable tourism planning: translating theory into practice. Journal of Sustainable Tourism, 19(4/5): 605-627. The third volume emphasizes principles of sustainability within the context of tourism and how these have come to dominate successful tourism planning and established best practices in the field. This volume will rely on a broader set of literature to explore principles such as equity, holistic development, ecological and cultural integrity, participatory growth, grassroots empowerment, and other such important concepts that must direct tourism planning today. 50. Ahn, B.Y., Lee, B.Y., and Shafer, C.S. (2002) Operationalizing sustainability in regional tourism planning: an application of the limits of acceptable change framework. Tourism Management, 23(1): 1-15. 51. Bramwell, B. and Lane, B. (2011) Critical research on the governance of tourism and sustainability. Journal of Sustainable Tourism, 19(4/5): 411-421. 52. Choi, H.S. and Sirakaya, E. (2006) Sustainability indicators for managing community tourism. Tourism Management, 27(6): 1274-1289. 53. Cole, S. (2006) Information and empowerment: the keys to achieving sustainable tourism. Journal of Sustainable Tourism, 14(6): 629-644. 54. Jordan, E.J. (2015) Planning as a coping response to proposed tourism development. Journal of Travel Research, 54(3): 316-328. 55. Kauppila, P., Saarinen, J. and Leinonen, R. (2009) Sustainable tourism planning and regional development in peripheries: a Nordic view. Scandinavian Journal of Hospitality and Tourism, 9(4): 424-435. 56. Keogh, B. (1990) Public participation in community tourism planning. Annals of Tourism Research, 17(3): 449-465. 57. Marzuki, A. and Hay, I. (2013) Towards a public participation framework in tourism planning. Tourism Planning & Development, 10(4): 494-512. 58. Mihalič, T. (2000) Environmental management of a tourist destination: a factor of tourism competitiveness. Tourism Management, 21(1): 65-78. 59. Moscardo, G. (2011) Exploring social representations of tourism planning: issues for governance. Journal of Sustainable Tourism, 19(4/5): 423-436. 60. Murphy, P.E. (1988) Community driven tourism planning. Tourism Management, 9(2): 96-104. 61. Neto Simão, J. and do Rosário Partidário, M. (2012) How does tourism planning contribute to sustainable development? Sustainable Development, 20(6): 372-385. 62. Okazaki, E. (2008) A community-based tourism model: its conception and use. Journal of Sustainable Tourism, 16(5): 511-529. 63. Russo, A.P. and van der Borg, J. (2002) Planning considerations for cultural tourism: a case study of four European cities. Tourism Management, 23(6): 631-637. 64. Sautter, E.T. and Leisen, B. (1999) Managing stakeholders: a tourism planning model. Annals of Tourism Research, 26(2): 312-328. 65. Scheyvens, R. (2000) Promoting women’s empowerment through involvement in ecotourism: experiences from the third world. Journal of Sustainable Tourism, 8(3): 232-249. 66. Scheyvens, R. and Momsen, J.H. (2008) Tourism and poverty reduction: issues for small island states. Tourism Geographies, 10(1): 22-41. 67. Simmons, D.G. (1994) Community participation in tourism planning. Tourism Management, 15(2): 98-108. 69. Timothy, D.J. (1999) Participatory planning: a view of tourism in Indonesia. Annals of Tourism Research, 26(2): 371-391. 70. Timothy, D.J. and Tosun, C. (2003) Appropriate planning for tourism in destination communities: Participation, incremental growth and collaboration. In S. Singh, D.J. Timothy, and R.K. Dowling (eds) Tourism in Destination Communities, pp. 181-204. Wallingford, UK: CAB International. 71. Timur, S. and Getz, D. (2009) Sustainable tourism development: how do destination stakeholders perceive sustainable urban tourism? Sustainable Development, 17(4): 220-232. 72. Wang, Y. and Wall, G. (2007) Administrative arrangements and displacement compensation in top-down tourism planning—a case from Hainan Province, China. Tourism Management, 28(1): 70-82. The fourth volume emphasizes contemporary trends and future trajectories in tourism planning issues. Destination management organizations and other tourism planners will need to address the following issues in the near and medium-term future: climate change, technological advancements, human rights and social justice, globalization processes and neoliberalism, poverty alleviation through tourism, security agendas, slow tourism, resource depletion, responsible tourism, new markets (e.g. travellers with disabilities, the aged, the growth of the Chinese outbound market, etc), and the growth of new forms of tourism (e.g. medical and volunteer). Each of these phenomena requires its own tourism planning approach, principles and perspectives. This will be the focus of the final volume from a futures perspective. 73. Bonzanigo, L., Giupponi, C. and Balbi, S. (2016) Sustainable tourism planning and climate change adaptation in the Alps: a case study of winter tourism in mountain communities in the Dolomites. Journal of Sustainable Tourism,　24(4): 637-652. 74. Butcher, J. and Smith, P. (2010) ‘Making a difference’: volunteer tourism and development. Tourism Recreation Research,　35(1): 27-36. 75. Connell, J. (2013) Contemporary medical tourism: Conceptualisation, culture and commodification. Tourism Management,　34: 1-13. 76. Darcy, S. (2010) Inherent complexity: Disability, accessible tourism and accommodation information preferences. Tourism Management,　31(6): 816-826. 77. Dredge, D. and Jamal, T. (2015) Progress in tourism planning and policy: A post-structural perspective on knowledge production. Tourism Management,　51: 285-297. 78. Gössling, S., Scott, D., Hall, C. M., Ceron, J. P. and Dubois, G. (2012) Consumer behaviour and demand response of tourists to climate change. Annals of Tourism Research,　39(1): 36-58. 79. Hall, C. M. (2010) Crisis events in tourism: subjects of crisis in tourism. Current issues in Tourism,　13(5): 401-417. 80. Hall, C. M., Baird, T., James, M. and Ram, Y. (2016) Climate change and cultural heritage: conservation and heritage tourism in the Anthropocene. Journal of Heritage Tourism,　11(1): 10-24. 81. Hartman, E., Paris, C. M. and Blache-Cohen, B. (2014) Fair Trade Learning: Ethical standards for community-engaged international volunteer tourism. Tourism and Hospitality Research,　14(1-2): 108-116. 82. Hayle, C., Ramjee, D. and Wright, A. (2010) Planning for tourism resilience in the Caribbean. Journal of Eastern Caribbean Studies,　35(1): 36-59. 83. Hopkins, L., Labonté, R., Runnels, V. and Packer, C. (2010) Medical tourism today: what is the state of existing knowledge?. Journal of Public Health Policy, 31(2): 185-198. 84. Kaján, E. and Saarinen, J. (2013) Tourism, climate change and adaptation: A review. Current Issues in Tourism,　16(2): 167-195. 85. Khazaei, A., Elliot, S. and Joppe, M. (2015) An application of stakeholder theory to advance community participation in tourism planning: the case for engaging immigrants as fringe stakeholders. Journal of Sustainable Tourism, 23(7): 1049-1062. 86. Kim, H. and Marcouiller, D.W. (2015) Urban vulnerability and resiliency to natural disasters: an integrative tourism planning perspective. In P. Filion, G. Sands and M. Skidmore (eds) Cities at Risk: Planning for and Recovering from Natural Disasters, pp. 159-188. London: Routledge. 87. Lew, A.A. (2014) Scale, change and resilience in community tourism planning. Tourism Geographies, 16(1): 14-22. 88. Moriarty, J. P. (2012) Theorising scenario analysis to improve future perspective planning in tourism. Journal of Sustainable Tourism,　20(6): 779-800. 89. Pforr, C. and Hosie, P.J. (2008) Crisis management in tourism: Preparing for recovery. Journal of Travel & Tourism Marketing, 23(2-4): 249-264. 90. Schellhorn, M. (2010) Development for whom? Social justice and the business of ecotourism. Journal of Sustainable Tourism,　18(1): 115-135. 91. Scheyvens, R. (2007) Exploring the tourism-poverty nexus. Current issues in tourism,　10(2-3): 231-254. 92. Simão, J. N. and Partidário, M. D. R. (2012) How does tourism planning contribute to sustainable development? Sustainable Development,　20(6): 372-385. 93. Xiang, Z. and Gretzel, U. (2010) Role of social media in online travel information search. Tourism Management,　31(2): 179-188.